Now might be the time to hop into a Ford. Ford is "hitting its sweet spot," Goldman wrote in a research note Wednesday, especially with its new truck line. At first, it sounds like an odd recommendation. Ford (F) stock has barely budged in 2015 despite a surge in auto sales. And Ford shares have trailed rival General Motors (GM) in the past year. But Goldman Sachs is betting that's all about to change. Ford will be the company with superior growth now, not GM. That's why Goldman upgraded Ford to "buy" from "neutral" and raised its 12-month price target on the auto maker's shares to $19. That implies about a 25% upside from Ford's closing price of $15.29 on Tuesday. Meanwhile, Goldman believes GM's "momentum is likely slowing." The bank went as far as taking GM stock off its recommended stocks to buy list. Trucks to power Ford ahead: The big auto call is based on the fact that there are two key differences between Ford and GM -- and both favor Ford. 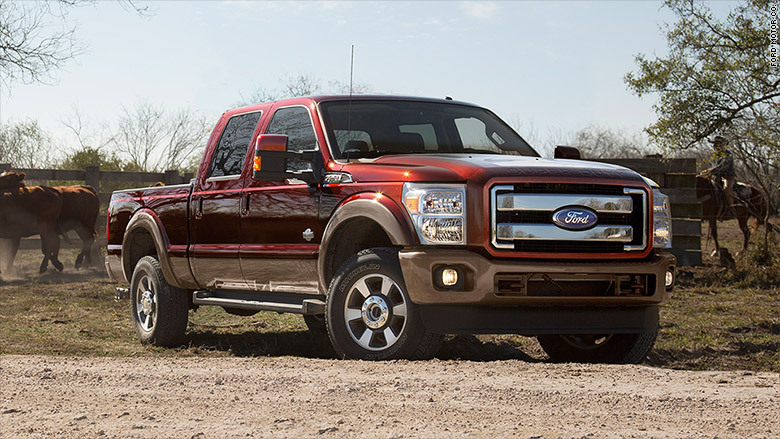 First, Ford is one year behind GM in its truck refresh. That process is entering primetime now, headlined by the new aluminum body F-Series that is priced competitively and likely to entice customers to switch to Ford from other automakers. The new F-150 is poised to launch later this year, potentially stealing sales from GM. By comparison, GM has already refreshed its pickups. It's now focused on updating passenger cars, but that highly-competitive space is subject to heavy discounts that eat into profits. That's why Goldman believes GM's North American profitability has likely peaked and is subject to slight declines through 2018. Ford, on the other hand, could enjoy a big bump in North American profits. GM vulnerable to bumpy ride in China: The other key difference is China. Goldman just dimmed its forecast for auto sales in China amid the country's economic slowdown. That's bad news for both auto makers, but especially GM. It owns 14% of the market share there, versus just 4.5% for Ford. "Ford is less vulnerable to a softening China," Goldman wrote. Ford also has more room to grow in that key market. It's launching an aggressive push there by introducing 15 models this year alone. Wall Street didn't wait long to heed Goldman's advice. 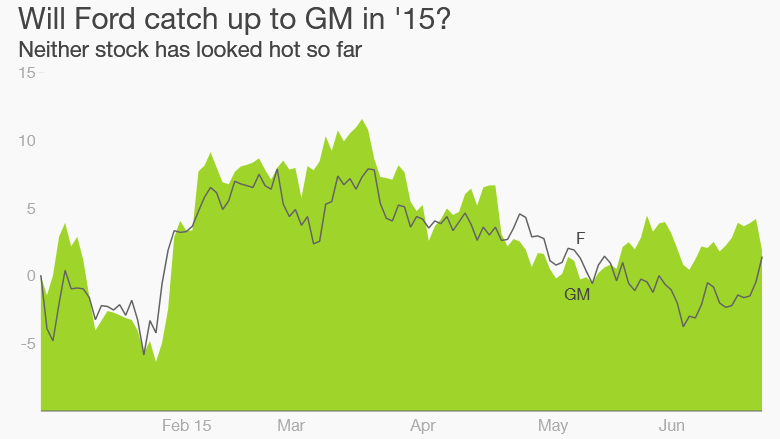 Shares of GM dipped nearly 2% on Wednesday, while Ford revved that much higher.